Norway police admit the investigation into how an iron gate stolen from Dachau ended up in western Norway is complicated. The investigation into how an iron gate stolen from the Dachau concentration camp in southern Germany ended up in western Norway may be complicated because “no usable evidence” has been found, police said Saturday, according to The Associated Press. 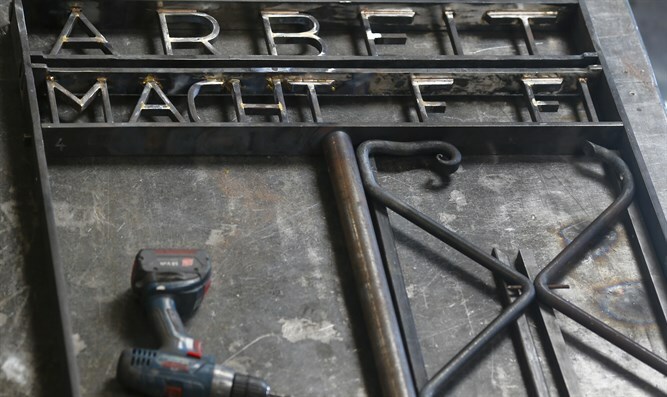 The iron gate with the slogan “Arbeit macht frei” (“work will set you free”) from Dachau was found in Norway two years after it was stolen, thanks to what police said on Friday was an anonymous tipoff. Police spokeswoman Kari Bjoerkhaug Trones said the gate was found November 28 under a tarpaulin at a parking lot in Ytre Arna, a settlement north of Bergen, Norway’s second-largest city. “It has been there for quite some time with some junk under a tarpaulin. Our forensic teams have found no usable evidence like DNA,” Bjoerkhaug Trones told The Associated Press. The gate was now in police care, she said, adding they have no suspects. The theft of the 100kg (220lb) gate was reported on November 2, 2014, sparking uproar, with German chancellor Angela Merkel calling it “appalling”. The Dachau camp, located just a few miles from Munich, opened in 1933 and during the Second World War became a death camp where more than 41,000 Jews were slaughtered before U.S. troops liberated it on April 29, 1945. Jean-Michel Thomas, president of the International Dachau Committee that represents former prisoners, survivors and victims from Dachau, was “very happy” with the recovery of the gate. Another sign with the same inscription at Auschwitz was stolen in December of 2009. Polish police recovered the sign several days after the theft, broken in three pieces. It was restored two years later. The mastermind of that theft, the Swedish neo-Nazi Anders Högström, was caught and jailed for two-and-a-half years.